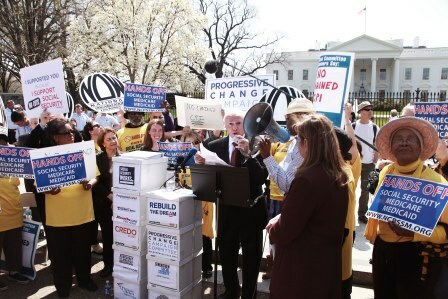 Senator Bernie Sanders Speaks at an April 9, 2013 Protest Outside the White House Over the President's Plan to Cut Social Security Benefits. In what is likely an historical first for a Democratic President, groups that were his most loyal and hardworking supporters during last year’s campaign massed outside the White House yesterday to pronounce the President a traitor to his people and his party. Just five months after spending millions from their campaign war chests and an equal amount of volunteer hours, the progressive groups who delivered a second term to Barack Obama feel betrayed. Using unusually harsh language and delivering 2.3 million signed petitions, the President’s base came to warn Congressional Democrats against falling in lockstep with the President. The uproar comes over the President’s plan, to be unveiled today in his budget proposal, to cut Social Security payments by indexing benefits to a chained Consumer Price Index (CPI), a process viewed as a rigged system of reducing payments over time to the Nation’s most vulnerable seniors, veterans and disabled. Under chained CPI indexing, it is estimated that a Social Security recipient could receive $1,000 less annually after 20 years. “Because of the wage gap, and time taken out of the paid workforce for caregiving, hardworking women retire with less money than men — often with no savings or investments to sustain them other than Social Security. Those who say the chained CPI won’t make much of an impact are either hopelessly dense or just plain deceitful… Let’s face it: instituting the chained CPI is like tripping someone at the end of a race after forcing them to run on the outside lane the whole way,” said O’Neill. Jim Dean, Chair of Democracy for America, which has over a million members, called the plan “shameful” and said “Real Democrats do not cut Social Security, Medicare or Medicaid. Period.” Dean added that “the era of triangulation is over,” and promised that any Democrat who votes for this plan will face a primary challenge when they run for reelection. “For the Democrats in Congress who have not made up their minds yet, you are either with us, or you are against us,” Dean said forcefully. Two other groups at the protest were Social Security Works and Campaign for America’s Future. It was as hot as a summer’s day in the Capital yesterday, but this lively protest delivered a cool, fresh breeze to the status quo of beltway politics. The question is, will the President listen?